The rudimentary architecture that one expects of documentary films—facts, tilted this way or that, conveyed by means of a simple narrative—is nowhere to be found in Terence Davies' Of Time and the City. 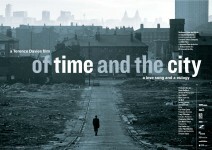 Serving as both ode and elegy to the Liverpool of his youth, the film lazes through archival footage of the industrial city, most in black-in-white, some in color. Davies himself narrates—his exquisitely British voice all scratchy wool and rich cream—offering remembrances of his own life that illuminate the generalities of a bittersweet urban existence. Proceeding much like the wandering thoughts of a reflective old man (which I suppose it is), Of Time and the City takes its sweet time getting nowhere. It's the sort of film-making that throws you for a loop, if only because its approach is so unusual. (The only stylistic fellow traveler that springs to mind is Koyaanisqatsi, but only because that film is so de-personalized in comparison.) However, owing to the potency of Davies' warm, tear-wetted poetics, the film's meditative qualities are never off-putting. In short, Of Time and City, is a strange, beautiful little film, a memory thrown up on screen with all its indulgences and ambivalence intact.